I was recently on vacation to Vegas and my Dad mentioned that a Beatles tribute band, called the Fab Four, was playing while we would be there. I tossed my trusty portable cassette recorder into my bags, on the off chance that I got to interview the band. Two days into my trip, I bought tickets for the last night of the Fab Four's appearance in Vegas. I arrived early to ask their manager, Jerry, if an interview would be possible. He was most gracious, considering that I had NO credentials on me (hell, it WAS a vacation!). Anyway, I was ushered into the dressing room where "John" (Ron McNeil) & "Paul" (Ardy Sarraf) were preparing themselves for the show. It was truly amazing talking to the guys while they made their transformation into their Beatle counterparts- "John" (Ron) was putting on his sideburns & eyebrows and "Paul" was getting into costume. The guys were thoroughly entertaining & witty, often breaking into British accent ad libs, and joking about my apparent lack of credentials. Finally, after my batch of questions, I noticed the time on the dressing room clock was fastly approaching showtime. I thanked them and turned around to leave, running smack into none other than "Ed Sullivan"! Both "John" & "Paul" chimed in unison (in that familiar Liverpudlian accent), "Ronnie, say ello to Ed". What a time to have left my camera back at my seat! I shook hands with "Ed" and returned to my seat, expecting an entertaining show, but not getting my hopes up too high. After all, I have seen a half-dozen Beatles tribute bands over the years, ranging from mediocre to great. Little did I know that I was about the see the BEST Beatles tribute band around. E.C. : How did you guys first get together and how long have you been together? Ardy: This band has been together for about 5 years, through mutual friends and conventions we hooked up and saw each other play at different times in our lives and suddenly decided let’s put a good band together and this what kind of evolved from it. E.C. : So where you all in groups before you knew each other? Ron: Yeah we were with separate Beatles groups and then we realized we all live very locally and we all just happen to be all from L.A. and we happen to know each other and like each other and worked with each other at one point so we said well what are we doing playing in different groups? Why don’t we form a group together? E.C. : Did you ever play original music on your own? E.C. : But it must be more satisfying to play to a big crowd and get a response? Ardy: Oh yeah, absolutely! But for different reasons. Obviously you’re doing your own material and you get the satisfaction of singing your own part. But on the other end of the stick, like you said, more people are going to come to a Beatles show and go to Brazil or Hong Kong and everywhere and everyone knows Beatles music and they don’t even speak the language, much less try to get your own song across. E.C. : That was going to be another one of my other questions, where all do you play? Ron: Name it and we’ve probably done it. Ardy: Ardy: Yeah in three weeks we’re going on one to Alaska, and that’s for 8 days a week…thought I’m not sure if they’re actually doing Beatle cruises, but I think this is the first successful one, and we’re part of it. E.C. : How did you study for the roles? Ardy: Well, for myself personally, you know when John Lennon died that was kind of my personal “well who was this guy?”, I didn’t know which one he was and my sister happened to have some old albums so I listened to that and kind of thought “wow this is kinda cool” and got the Hollywood Bowl on 8-track. That was my first actual own piece of Beatles record, and I still have it. I like all their singles, I still do but somehow I think the McCartney tone in my voice evolved and it kinda came out and I’m a big Queen fan too and the Everly Brothers and a lot of influences they had too, you know the old rock and roll. E.C. : Are you normally left handed? Ardy: No, I’m right handed. I’m right handed everything else but in the Beatles show I’m left handed. E.C. : Okay ‘cause there was that group 1964, that’s the one I’ve probably seen the most. And supposedly he started playing right and a few songs he would learn on left so he had 2 basses for the show. Ardy: That’s exactly what I did for about 3 or 4 months. I would do the early set first and then play run and Sgt. Pepper’s style. E.C. : Did you watch any of the films to get the mannerisms down and all that? Ardy: Yes, lots and lots of videos. E.C. : Did you have someone critique you to tell you if you were doing it right? Ardy: No, every kid who ever heard a Beatles record wants to be a Beatle…it’s easy for us…Me and about 5 million other people. Ardy: Yeah we take some artistic license but we don’t take o urselves…I mean we take ourselves seriously enough that we wanna get the music across and we wanna be entertaining people, you give them a good show, kinda give them a sense of what the Beatles did in an hour and a half show. That’s what we just try to do is present a good show and have fun with it to and kind of…having Ed Sullivan as the host. It’s a nice combination. Ardy: That’s why it’s not a true tribute! E.C. : And I’ve seen some that will…there was one I think called "Beatlemania", it had a few players that did the show, and they did the whole gimmick from like the early years to the rooftop. Ardy: That’s what we do too, and the essence of a tribute to me is the whole thing. Like how can you only do a Revolver album? It’s like well wait a minute, what about all the other albums? 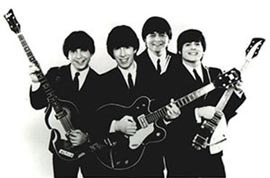 Ron: 1964, we’re great fans of them but you’ll never hear them do Hey Jude or something like that. We’re the only four-piece in the world that performs all that later stuff live. E.C. : Yeah, something like that. Ron: They do have mini-sequencers where you basically press, you program ahead of time what you want it to play, then you press a button and then the keyboard plays itself back what you just told it to play. But we don’t use any of that. 1964, they only play the early stuff…it could have been another group that maybe…there’s a lot of groups that do those sort of things. Ardy: To me, to finish up that whole thing, if I was a Beatle fan..I’m a Beatle fan and I like to go see other groups play. And a Kiss fan too, I went to go see a couple of Kiss tribute bands to see what it’s like. E.C. : As for me, I never got to see them at their heyday because I was too young to go, and then I finally saw Strutter, and it was so amazing and their mannerisms, they had them down. Ardy: Yeah, you know, to me that’s..if a Beatle band that I go to see doesn’t do a pretty wide spectrum of songs then it’s not worth it to me. Ron: I mean we’re doing an hour and a half set and we’re still not doing Let It Be, you know…we can’t do them all because they’ve got so many great songs and for me to narrow it down into one particular era is like cheating Beatle fans, just in my opinion. You’re cheating them out of some of the greatest songs they ever did. Ardy: But so far we’ve got a lot of good music here and we’ve gotten nothing but positive feedback, so it’s going to be good. We’re supposedly going to come back to do a 3 to 6 month run at the end of this year. E.C. : There was one tribute band that I know of, they were on the sidelines selling their band tapes. What they were doing was making independent music. Ron: That’s cool. We’ve never really made music together as an original group, but individually we’re doing stuff. I’ve got recording equipment on my laptop computer that I bring with me to all our shows so that at any point if I got some creative juices going I could just plug it in and get it going. E.C. : I saw something on one of the monitors around the hotel and it was a film of you playing in black and white…that was so cool. Ron: That’s our demo. You can catch that on the internet, we have a few clips on the internet. Ardy: That whole demo, our whole album was filmed completely with real tape. That’s what made it look so good. E.C. : How did you study for like the talk between songs and interaction with the audience? Ron: That’s the hardest part actually because singing, obviously you know the songs, but talking to the audience, especially if something happens impromptu and you gotta respond to it like the real band would. You know, you’re like “hey check it out that girl fell down” and you’re like wait a minute…”hey look Paul the girl fell down” (in a British accent). You know, you’ve gotta say it like that otherwise people are like hey wait a minute, what happened to their accents? So that’s gonna harm you, and that’s the part we beat ourselves up the most about. We have to be musicians, actors, comedians, performers, all these crazy different things that I never thought I’d be asked to do as I started off as a musician. But when it comes down to it, you are all those different things. And we wrote the show ourselves…and like we don’t have some guy telling us what to do, what to say and where to stand. Ardy: And of course we’re here on a budget. E.C. : And that’s another thing, to get all the authentic instruments and the amplifiers. Ron: Yeah, all the instruments, obviously they’re re-issues and people dig that. When I first got in business, I was playing through a fender amp or something like that with the Rickenbacker too, and something’s just not right about the sound. When I plugged it into a box it would go (makes a buzzy noise). So that now since then, I can’t turn it on, it’s impossible to turn it back and I’m like well now. Vox, I mean, there’s really no other way to get THAT sound. E.C. : Finally, what is the competition between Beatle tribute bands like? Ron: In past years it’s been pretty bad. But a lot of the people who are doing it now are a little on the older side, we’re one of the younger Beatle bands. Ron: At this point were sitting in a pretty good position to be the best, which I think we are. You can judge for yourself. We don’t try to take ourselves too seriously. In the Beatle world, as far as competition goes, not many people can go up and do what we do…and do it a lot better than we do.